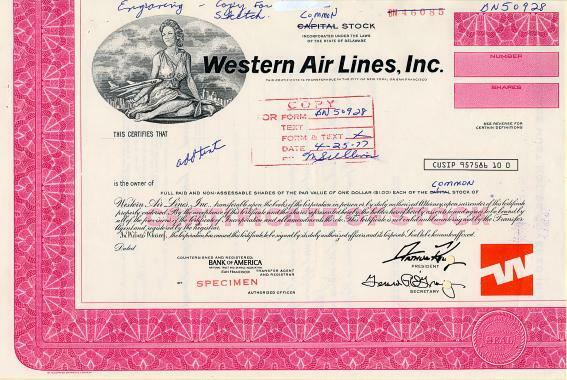 "Western Airlines Production Specimen and Model," CA. 1977. 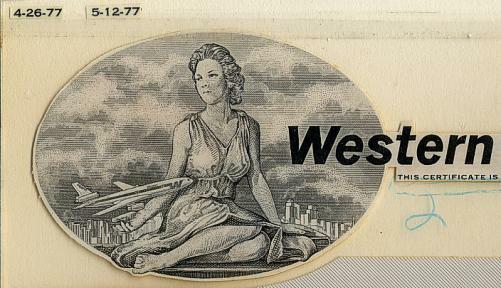 4 different certificates, all with allegorical woman sitting with jet almost in her lap. 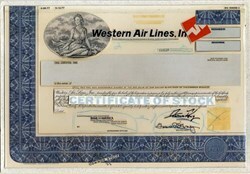 1) Unique approval proof model or mockup of odd shs, common stock with blue border. 2)to 4) 3 different specimen certificates, odd shs, red with archival notations; less than 100 shs, green (no notations) ; 100 shs, orange (no notations). Also includes a few pieces of correspondence. Choice group.